Every morning, you can usually find me waiting in the queue for my caffeine fix at Kinfolk Café (673 Bourke Street, Melbourne). Operating as a social enterprise, Kinfolk is not only a place to grab a coffee or lunch selection from the handwritten menu. It is a place where you will find community, sense a unique warm and fuzzy feeling every time you walk in because of the staff and volunteers that keep the place ticking, and convert yourself from coffee aficionado to philanthropist with every sip of your latte. I’m keen on this place. I love its values. I appreciate its warmth. I value their philosophies. I admire the way they operate. Their food is scrummy. And they make darn good coffee. Head barista, Candy, is normally tucked away behind the coffee maker, so in between her lattes and skinny flat whites, I managed three quick questions to my Everyday Hero. Every cup of coffee is made with love. Why? It’s definitely because of the customers. I want to make sure they enjoy their coffee and the experience. Kinfolk is not just a café. It’s a community. And it’s awesome to be able to give back to our community and the organisations we support. Did you want to be a ballerina when you grew up? I’ve been in hospitality since I was 16. It was my first job and it’s now my career. I can’t think about doing anything else. 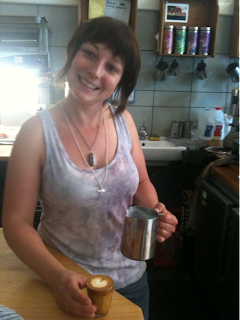 I’m planning on opening my own fully sustainable café in Brisbane in 2011. Is coffee an important part of your day and why should it be for everybody else? I need to have a coffee to kickstart the day, otherwise I can get a little grumpy. For most people, getting a coffee is the first social interaction they will have each day. So for me, it’s really important to make it a positive experience. That’s why I’m committed to making great coffee and ensure a great vibe. A month and a little bit..